I ran across two worthwhile essays in the last week. The first was about reasoning from first principles, and it linked to the second, about Elon Musk. Both were written by Tim Urban. I’ll put the links at the bottom of this post. I’m writing now (1) to sketch how I came to readable writing by reasoning from first principles, and (2) to quote an amazing paragraph from Elon Musk. First-principles thinking is one of the best ways to reverse-engineer complicated problems. Sometimes called “reasoning from first principles,” the idea is to break down complicated problems into basic elements and then reassemble them from the ground up. It’s one of the best ways to learn to think for yourself. 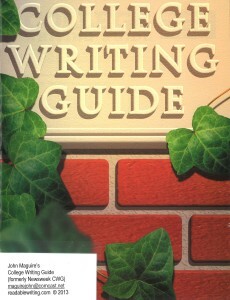 The readable writing method solves the difficult problem of slow progress in freshman writing courses. Those of you using the book know it’s a a reverse-engineered product. It started when I made a list of all the obstacles to learning that students face in a comp course, and then asked what I could invent to deal with them. The major obstacle to student learning, I realized, is the problem of jumping around and changing focus in the course. Teachers jump randomly from high-level instruction, say on how to write an essay, to low-level instruction, for example, on fixing sentence fragments. It’s the randomness that’s the problem. Haphazardly jumping from focus to focus makes learning very hard. The solution from first principles is a steady focus, with no lurching about. The solution would be a two-part course with two solid themes, one before the othter. The first half would focus on the sentence, in depth. The second half would focus on essay-writing. This single decision to stop jumping around inside the course did indeed solve most problems and speeded up student learning. Here’s the quote about rockets I mentioned. Elon Musk is speaking. (Emphasis mine). Historically, all rockets have been expensive, so therefore, in the future, all rockets will be expensive. But actually that’s not true. If you say, what is a rocket made of? It’s made of aluminum, titanium, copper, carbon fiber. And you can break it down and say, what is the raw material cost of all these components? And if you have them stacked on the floor and could wave a magic wand so that the cost of rearranging the atoms was zero, then what would the cost of the rocket be? And I was like, wow, okay, it’s really small—it’s like 2% of what a rocket costs. So clearly it would be in how the atoms are arranged—so you’ve got to figure out how can we get the atoms in the right shape much more efficiently. And so I had a series of meetings on Saturdays with people, some of whom were still working at the big aerospace companies, just to try to figure out if there’s some catch here that I’m not appreciating. And I couldn’t figure it out. There doesn’t seem to be any catch. So I started SpaceX. More on these ideas later.